Enemy Occupation System (EOS) is a highly customisable and powerful script that enables mission designers to easily populate their scenarios with AI units. Units spawned within the EOS environment are automatically removed when not required to save resources and ultimately enable larger multiplayer missions without lag and de-sync. -	Spawn AI infantry, divers, boats, motorised infantry, armoured vehicles, helicopters and Static placements. - Vehicles are crewed manually using unitpools "_crew" and "_helicrew". Increase flexibility for custom units. - Removed functions;EOS_LightVeh,EOS_Armour,EOS_spawnStatic, EOS_Chopper. Replaced with EOS_fnc_spawnvehicle. - Helicopters available in EOS and Bastion! - Completed EOS zones become empty zones. I greatly appreciate any support, no matter how small. It really helps knowing that people enjoy my hard work and motivates me to continue to increase my knowledge of ArmA scripting. Updated with video demonstration + instructions. Thanks for this script BANGA!! Going to be making an urban fighting mission in the next week so will give this a go and let you know mate. Thanks. That upload shite (I mean site) is rubbish. Send it to Armaholic or somewhere decent to get noticed mate. The guys who are armaholic admins on here usually look for stuff like this and upload it to their site themselves don't they? Maybe they will see it and put it on there for him. 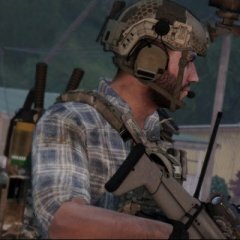 I've played a mission using this script btw as bangabob and I are in the same arma community (SilentWarriors); it does mostly seem to work well from what we've seen so far, and it seems like it will enable people to quickly make insurgency style area capture missions. I tried Armaholic but it is hard to navigate the site to an upload page. Brilliant Banga, im loving all the new scripts like these, thanks!! One question.. Is there a way to get the units that have spawned outside buidlings (inc vehicle) to patrol around a bit rather than just stay in one spot? Links to submitting pages are on the homepage, I never knew we made it to hard like this. In your head. I'm an figment of your imagination. Awesome and very handy script, thanks for sharing it with the community. -would it be possible to have caching on TRUE, while still having the effect of the marker turning green when the spawned units are dead? -what line exactly do I have to change numbers to bring down the amount of units spawning? Yes the squads that don't spawn with shkbuildingpos should run "call bis_fnc_taskPatrol" which gives them waypoints. What I meant was having it function as in insurgency; enemies spawn and despawn in the red grids, but when you kill every spawned unit in a grid, the grid turns green and enemies stop spawning. You mentioned in your video that no other system despawns like this but DAC has for many many years. Of course it does things differently so maybe you were not comparing this to DAC. but DAC has for many many years. Of course it does things differently so maybe you were not comparing this to DAC. Updated version frontpaged on the Armaholic homepage. This is only a script, not a mission. I don't know he might reply and say he'll try it but I'd say it's up to you to as a mission designer to make objectives from it or to go alongside it. It's only one element of a mission you could build using it, not a mission itself. a script for intel and cache's combined with this would be perfect for an insurgency mission. im not asking him to make a mission. I'm asking for a script. read.